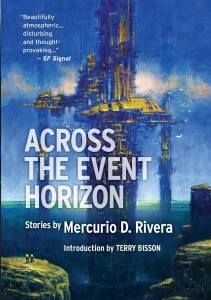 World Fantasy Award-nominated writer Mercurio D. Rivera’s stories have appeared or are forthcoming in a wide range of markets, including acclaimed venues such as ANALOG SCIENCE FICTION & FACT, ASIMOV’S SCIENCE FICTION, LIGHTSPEED, INTERZONE, BLACK STATIC, NATURE, ABYSS & APEX and anthologies such as YEAR’S BEST SF 34, edited by Gardner Dozois, YEAR’S BEST SCIENCE FICTION 17, edited by Hartwell & Cramer, UNPLUGGED: THE WEB’S BEST SF AND FANTASY, edited by Rich Horton, SOLARIS RISING 2, edited by Ian Whates, OTHER WORLDS THAN THESE, edited by John Joseph Adams, PARADOX: STORIES INSPIRED BY THE FERMI PARADOX, and CRISES AND CONFLICTS, edited by Ian Whates. 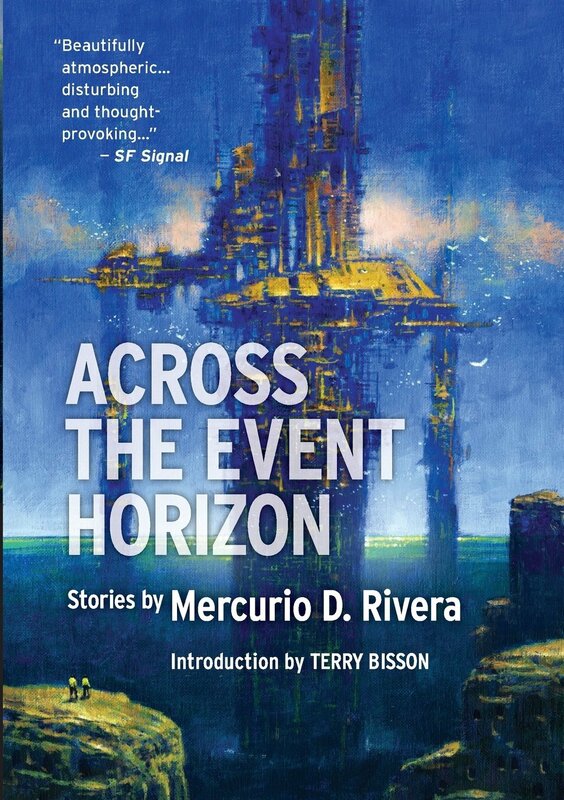 Tor.com called his collection ACROSS THE EVEN HORIZON (Newcon Press), “weird and wonderful,” with “dizzying switchbacks,” “a revelation” with “twists followed by more twists heightening a powerful sense of alienation and menace.” Learn more about Across the Event Horizon here. Ten of his stories have been podcast at Escape Pod, StarshipSofa, Transmissions From Beyond, Beam Me Up and Kaleidocast. StarshipSofa devoted a two-part installment to his stories. To access these various podcasts, click here. He has frequently contributed to the acclaimed British magazine INTERZONE with stories appearing in issue ##204, 214, 219, 226, 227, 235, 236, and 262. His story of heartbreak and unrequited love, “Longing for Langalana” was voted favorite story in Interzone‘s annual readers’ poll. His tales “Longing for Langalana” and “Tethered” (both about the Wergens, aliens biochemically attracted to human beings) and “Dance of the Kawkawroons” have been taught in lit courses and writing workshops at (i) San Francisco University, (ii) Columbia College Chicago, (iii) the New School (NYC) and (iv) the Instituto Pedagógico de Caracas, respectively. Eleven of his stories garnered “Honorable Mentions” in the late Gardner Dozois’s Year’s Best Science Fiction anthologies. Many of his stories have been translated and published in China, the Czech Republic, Poland and Spain. Mercurio has been a member of the highly regarded Manhattan writing group Altered Fluid since 2004.